Will Colt McCoy have room to operate against Tech? Texas faces another top ten team in what has to be the game of the week (sorry [tag]Florida[/tag] and [tag]Georgia[/tag]). This will be the third nationally televised game in the last four weeks for these Horns. Texas Tech is building this game as the “biggest” game ever to take place in Lubbock. The Tech fans are going to “black out” the stadium and the Longhorns are trying to do to Tech what [tag]Alabama[/tag] did to Georgia when the Bulldogs held a “black out” on ABC primetime. Let’s look at what we’re in for. In this year’s Big 12 conference I feel like I could write the same thing each week. The Longhorn offense faces a team that gives up and puts up points and yards in bunches. [tag]Colt McCoy[/tag] and his offense should have no problem putting up points; the question will be the strategy offensive coordinator Greg Davis uses to achieve those points. UT went over a quarter and a half without scoring a point to end last week’s [tag]Oklahoma State[/tag] game. Texas had their chances though, as McCoy committed two turnovers deep in OK State territory that allowed the Cowboys to stay in the game. The running game was lacking for the first time since conference started and I think the coaching staff would like to get that part of the offense back on track. When this team can run the ball the middle of the field becomes wide open for McCoy and [tag]Jordan Shipley[/tag] to work their overhyped roommate magic (they’re not over hyped, but their story has been). Most have been looking for Fozzy Whittaker to get his chance, and it might be this week. Tech has a new defensive coordinator but remains the same defense it always is. They give up points on big plays and can be overmatched physically if a team stays within striking distance. The Red Raider defense thrives when an opposing team gets so far behind that they become one dimensional out of necessity. The Longhorns keeping the game close in the first quarter will go a long way in determining the outcome. It will be up to the offensive to control the ball and come away with points on virtually every possession because Texas Tech will score points. The Longhorns will use short passes to set up the run as the game goes on. At this point in the season teams know who they are. 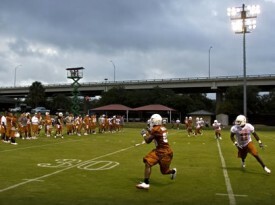 The Longhorns are a possession passing team with the ability to run at times. Colt McCoy is the leader of the offense and this unit goes as he goes. 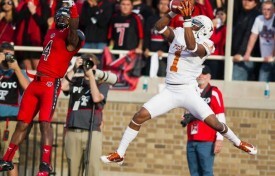 If McCoy can eliminate turnovers it is very doubtful Tech will be able to slow Texas down. This is where it gets tricky. Everybody knows what the offense does, but I’m not sure even the coaches or the players know much about this defense. On one hand the talent is not in question. When the outside guys get to rush the quarterback there is not another team in the nation that is more dangerous. The linebackers have been playing as well as a unit as any group under [tag]Mack Brown[/tag]. And the young secondary is getting better and better. On the other hand, this same group just gave up over 200 yards of rushing offense in a game, Texas as a defense, including leading tackler [tag]Roddrick Muckelroy[/tag], struggled with open field tackling, the two safeties are still freshmen, and injuries are plaguing the best two cornerbacks on the team. All this the week the number one ranked Horns take on the most explosive offense, when clicking, in all of college football. The good news is unlike the previous three weeks, the Tech offense won’t have a NFL caliber tight end. The bad news is Michael Crabtree still is in college. People talk about Jeremy Maclin and Dez Bryant, but neither of them compare to Crabtree. The guy is unbelievable and no one man is going to guard him. Defensive coordinator [tag]Will Muschamp[/tag] has shown he likes to leave a safety over the top against elite receivers, as he did with Maclin and Bryant. Tech’s offense makes it hard to do that to a particular receiver because every wide out can line up at all the receiver positions in the Mike Leach offense. This is the first year Muschamp has gone up against Leach, so it will be interesting to see what the first year coordinator does. Odds are [tag]Duane Akina[/tag] will be giving out advice this week because Texas has done relatively well against the Tech offense. This is another game where it seems the running game will be an after thought. Tech uses short passes, much like Texas coincidentally, to supplement the run game. This will force UT’s linebackers and safeties to tackle well in space. 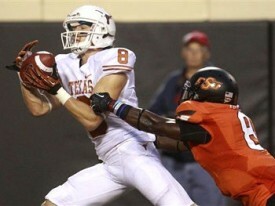 Open field tackling by the Texas defense will be the difference in the game. If Texas can stop plays immediately after a reception they have a good chance of making some stops and getting off the field. But if Tech’s skill position players are able to make big plays after the catch the Longhorn offense will be forced into a shootout. Mack Brown may not be finished with the coaching shuffle. Akina to Hawaii? Rucker out of coaching?? Holiday Bowl may be last shot for defensive coordinator Duane Akina. Maybe a chance he’s back in non-playcalling role next year? Last week’s keys didn’t work out so well. We barely won, Brian Orakpo got hurt, and John Chiles could barely even see the field from where he was sitting on the bench. Let’s hope the Horns come out firing against [tag]TCU[/tag] and turn things around for the rest of the season. 1. Get Jamaal Charles running north/south. There was some minor controversy this week over a [tag]Jamaal Charles[/tag] quote on Scout that the Longhorns’ sideways running style had made him more hesitant. I’m not sure he should have said it, but I agree with him. I don’t know if it’s Charles or the system (or both) but if your running back is spending half his time running lateraly you’re not going to be successful consistently. If we’re not running the zone read with an athletic QB then we should take a cue from teams like the Indianapolis Colts, which Greg Davis spent time with this offseason. If we can’t run more consistently from the shotgun then we have to put Colt McCoy under center more. 2. Don’t give receivers a ten-yard cushion. It doesn’t matter who our cornerbacks are if we continue to give wide receivers a 10+ yard cushion. Playing that far off you’re not going to get burned deep but you’re also going to let the opposing QB eat you alive ten yards at a time. If you let a quarterback get comfortable he’s making the easy passes. This week [tag]Duane Akina[/tag] has give Brandon Foster, Ryan Palmer, and/or Deon Beasley a better chance to succeed (or fail). 3. Convert short yardage opportunities. Not being able to get one yard costs us two games last season and almost costs us against Arkansas State. If it’s first and goal from the two or third and one, the linemen have to be willing and able to whoop somebody’s a**. The offensive line didn’t have a terrible game against ASU but couldn’t get it done when it mattered. Texas should be a team that can maul and get 2 – 3 yards even if everyone in the stadium knows it’s coming, but we haven’t been able to do that since Cedric Benson left.